A few things we’ve learned from Facebook’s founder-CEO putting on a tie and spending a couple of days in front of a joint Senate panel and Congress. 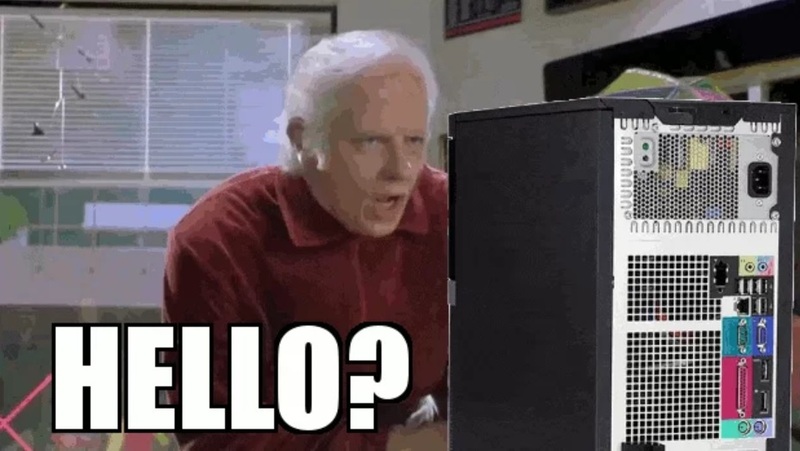 Old people do not understand technology, and Senators are old. Like, two hands on the remote control old. The median age of the ranking Senators conducting the hearing is about 80; average of the 55 Senators present is about 60. So unsurprisingly they don’t really get how Facebook works. But most of us aren’t being paid six figures to know this stuff either. Senators and Congresspeople should have done their homework. 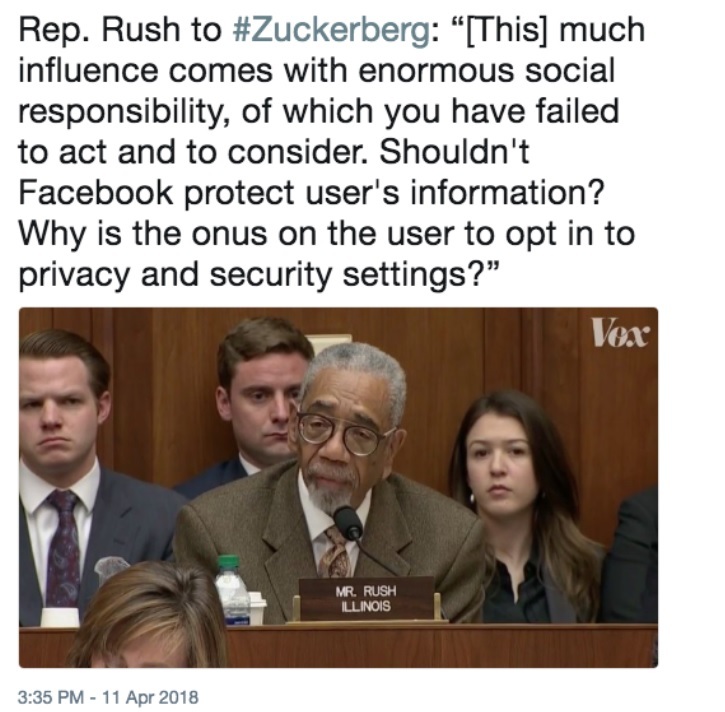 Instead, when they showed up to question Zuckerberg, the fact that they didn’t understand how Facebook works at all isn’t even the biggest problem. Instead it’s symptomatic of a deeper, broader, seemingly all-encompassing ignorance about tech. That’s where we’re at. These guys (yep, it’s almost all guys) are in the position of a hearing in 1935 asking Henry Ford how he feeds and waters his horseless carriage. So unsurprisingly there’s been a barrage of memes about the US Senate asking Zuckerberg how to make their kids be friends with them and all that good stuff. But it’s actually not that funny that the people conducting this important investigation don’t have a clue what they’re talking about. It’s what they’re paid for. And it’s their role in society: they’re supposed to ask more intelligent questions than a random collection of people off a bus would, and they’re supposed to be doing it to make sure that the state uses its power wisely for the benefit of all. 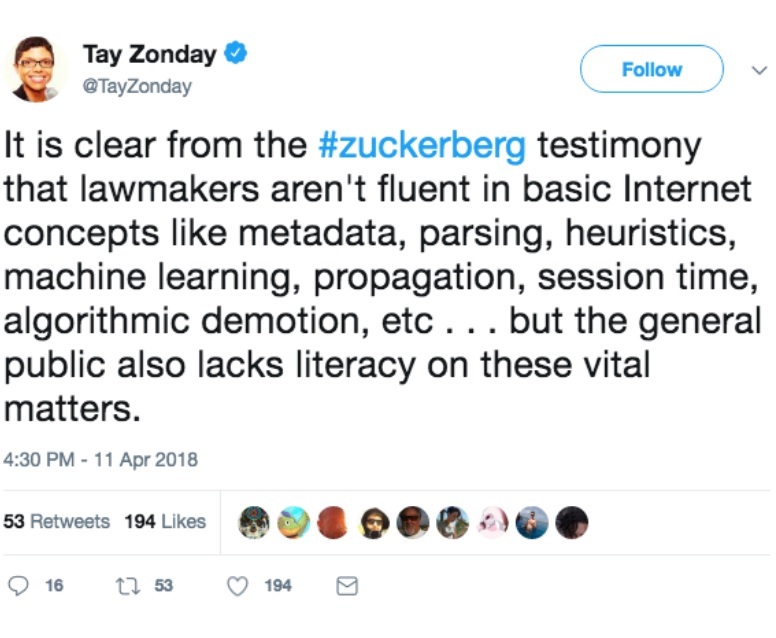 They’re spending the time they should be grilling Zuckerberg, getting I Can Has Internetz lessons from him instead. So Zuckerberg wore a suit. 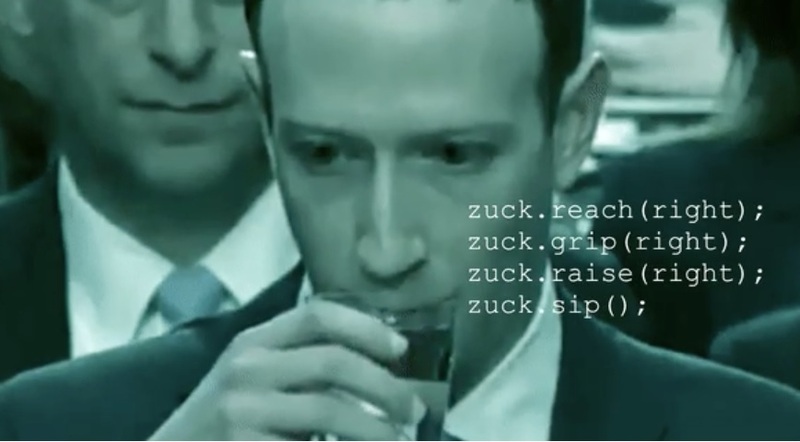 So Zuckerberg’s affect is very, very r/totallynotrobots. So Zuckerberg took a huge pile of notes in with him. Nothing like Facebook has ever existed before, and these hearings are about whether a private company has assembled a virtual surveillance state and then allowed it to be used to attack the sovereignty of actual real countries. So… don’t you think Zuckerberg should be sworn in? Yet, he isn’t. He’s not under oath. And of the 55 Senators who are lightly grilling him, largely about whether they can still get their free 30 hours from AOL, Facebook donated money to 46. The one running the show in Congress, Rep Greg Walden, gave Facebook tax breaks to move to his district. Others own $30,000 or more in Facebook stock. This is being made to look like a kid who’s finally found out that his actions have consequences. Hauled before the big boys in the Very Serious US House of Old People, he will now have to spill the beans, wear a tie, pull his pants up and say sir. But this isn’t the serious investigation we need and deserve. You’d have to be a conspiracy theorist to think they’re going to consciously go light on him because of Facebook campaign contributions: politicians in the US take money from everyone, everywhere, and ever since the Supreme Court decided that money is speech they’re under such fundraising pressure they barely have time to count it, let alone scruple about where it’s from. Instead, it points to the fact that Facebook is deeply embedded in corporate America – whether or not Zuckerberg wears a T-shirt and calls you dude. 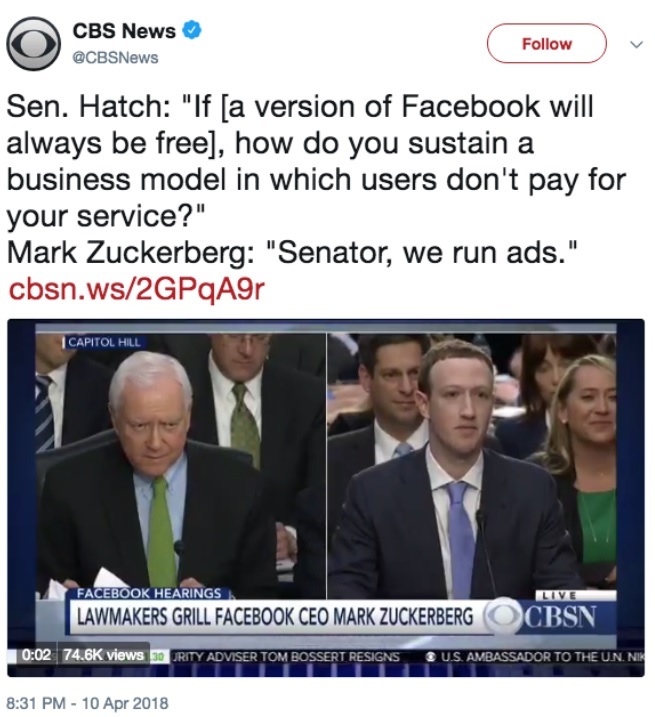 But it’s benefitting from not seeming that way; the Senate’s how-to-work-the-VCR questions, grip and grins and short periods for lines of questioning all help to conceal the gulf between Mark Zuckerberg ™ the cool tech kid and Mark Zuckerberg the corporate CEO. 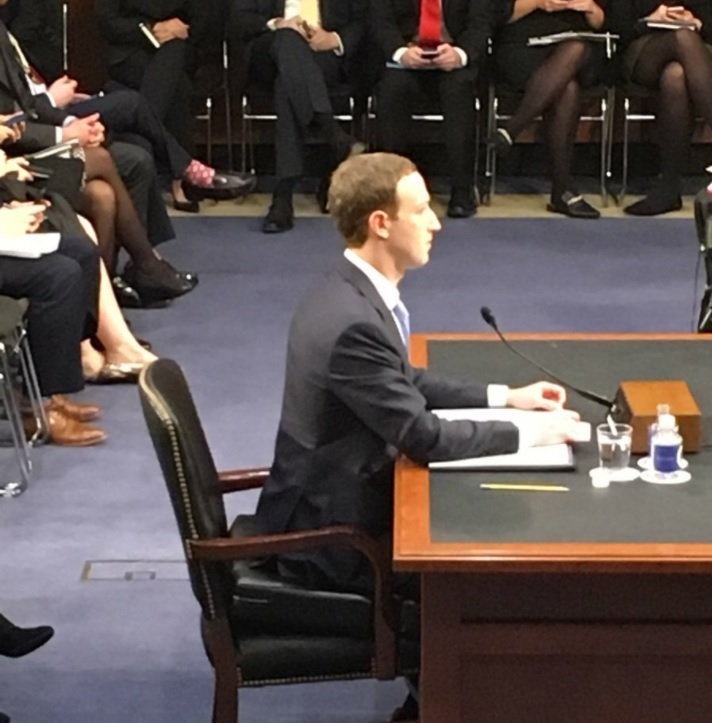 The constant playing on Zuckerberg’s dress, affect and booster seat have the same effect. Facebook owns half of the digital ads game worldwide. Are they not dealing with stuff like Cambridge Analytica because they can’t? It’s because they don’t want to. Facebook lost some of Mark Zuckerberg’s data. But that doesn’t mean we’re all in it together. Facebook has totally failed to protect its users. It let Cambridge Analytica read your private messages as well as your public profile and data. And it regularly lets the US government do the same, warrantless, in huge numbers. Plus, it sold ad space to a company it knew was a shill for Kremlin psyops. This is surveillance for sale, and the buyers are both demand-gen oriented businesses, and governments hostile to privacy and security. We should all be totally clear about this. Facebook is spyware. Look: I work in tech, sort of, and I like it that I get to do so wearing a T-shirt and calling people dude. But if you think it’s just Zuck on mock-trial here, you’re missing the point. Shallow culture warriors on the right are hooting, clapping their hands and, I don’t know, turning Hank Williams Jnr up dangerously high on their Walkmans at the sight of a young know-it-all from the Lib’ral establishment brought low. 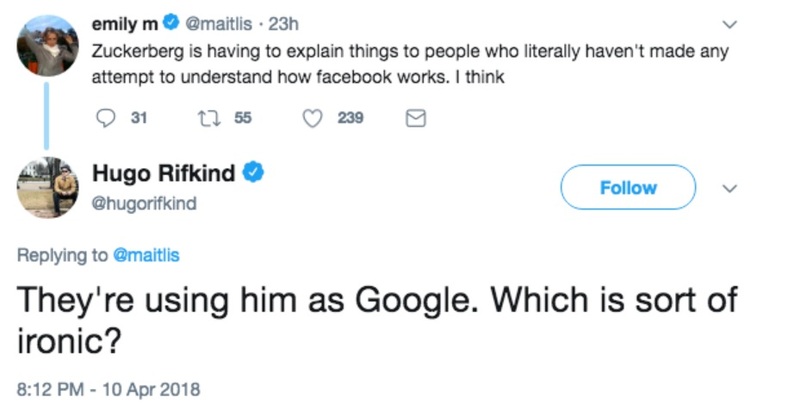 And as much as I hate Breitbart and all the rats who sail in her, yes, Zuckerberg has real questions to answer about how Facebook’s own internal decision-making process affected which news users got to see. But more important, this is the actual United States government – the part of it not currently having the details of its tawdry affairs seized by the FBI, anyway – trying to figure out what the hell the tech tools that have become the background of our lives are, anyway, and who should be in charge of them, and what their responsibilities should be. It’s easy to laugh at the paunchy Senators trying to get a handle on how tech works, but bear in mind how few of us have any real idea what’s going on under the hood of the tools we use every day. Just because we’re familiar with these things, doesn’t mean we understand them or know how they work. And we really should. Now, we’re going to have to. The power of big tech backed by the kind of money transnational corps and nation states can throw around is beyond question, and most of us are in the same position as the US legislative chambers: we don’t even know enough to ask the right questions. Some kind of cultural understanding, backed by appropriate laws about which parts of your life these guys are allowed to spy on, is going to be necessary, and we’re watching the faltering first steps. Don’t get me wrong. Facebook has built a seriously creepy business model based on what you could call the mass production of demand, generated by the mass consumption of personal data. But all of that was perfectly legal (apart from the stuff that the FCC is still investigating them for), and that is the problem. It’s not likely to stay that way. At least, that will include making privacy settings online opt in, not opt out. That would mean users would have to actively OK the use of their data at every stage, rather than companies presuming you’d be OK with being spied on unless you found and clicked a tiny link six pages deep. Facebook and other businesses wouldn’t be allowed by law to just routinely harvest your data. That would be a massive change in how business gets done online. But it may be that the problems built into Facebook and its whole generation of tech giants can’t be removed without destroying the companies themselves. 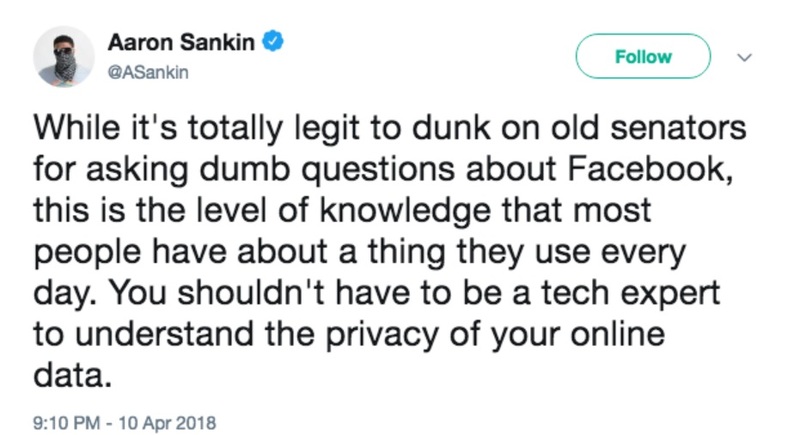 Zuck’s not the only person who thinks he has a right to spy on your every move without due process.